So it's another year. Let's do something. Seriously. I'll make it easy. We've done this in the past with great results. 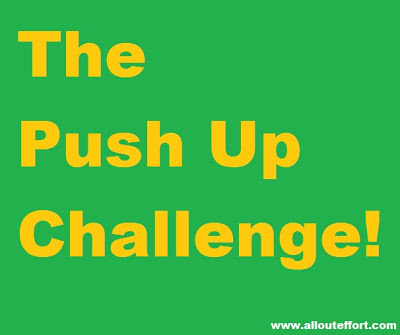 So I challenge you this year, starting Monday to do as many push ups as you can in one go. Whether its regular push ups, military style, push ups from knees, yoga push ups, push ups with poor form, whatever. Do as many as you can. Whatever you did, do the same amount for that whole week until Sunday. On the following Monday add 1 more push up and do that same amount for that whole week. So if you could only do 20, do 20 every day for 1 week, then 21 every day the following week. Do this for 5 weeks. That's 35 days folks of commitment. On day 36, which should be a Monday, test yourself again. See how many push ups you can now do at one go. I bet you would have not only spent just a minute of your day on your health consistently for 35 days, but would have increased your personal record for push ups by more than 5 push ups. If you started out with only 20 push ups and added 1 more push up every week, on day 36, I bet you will be able to do more than the 25 push ups you were doing the previous week. Probably more like 30. Consistent activity pays off, a minimum amount of work for a huge gain. That's all out effort. Don't think about it, put it on your calendar. Keep yourself accountable. Tell others to do it, get people you know to do it with you. Post your commitment, or send me how many push ups you ended up doing if you need to be held accountable. It's a New Year, put your health first, start with this and see where you'll end up. You start with push ups but you will find it evolves to more exercises, you'll want to do sit ups to even your upper body out, then you can't forget about your legs, next thing you know, habits are forming. No fitness resolution works unless you do it.